Various stuff. Plus, Gaslight wins a Gold ENnie! Sometimes, there are lulls in projects, where i’m not working on much, or i’ve just got one book or something that i’m concentrating on. Other times (and they’re pretty rare), it feels like i’m juggling five very pissed off tigers. That are all on fire. Plus a couple of chainsaws. Juggling them all with one hand. Whilst riding a unicycle. That’s got a seat covered in grease. This? This is one of those times. To keep track of everything that i’ve got going on, i assembled a list on my whiteboard, complete with status and colour coding. I’ve got, uh, nine things in various states. Medieval Tales: Work continues apace on this. Mostly been concentrating on the Tales section, though i was able to get the chapter heading page wrapped up as well (and man was that a lot more difficult to put together than i anticipated). The artwork looks really great; you can see a couple of examples of the progress on Red Lion Publishing’s news page. A Season in Carcosa: This kinda came up on me so fast, i haven’t had an opportunity to even mention this one yet. It’s a collection of Cthulhu Mythos fiction, all centering around The King in Yellow, edited by Joe Pulver, Sr. Trying to crank this one out as soon as possible (which, since it’s almost all text, is a fairly quick project. Although italicized text is my bane at the moment). This one will be published by Miskatonic River Press. You can read more about it here. Meanwhile, Tales of the Sleepless City is temporarily put on hold until Carcosa is done; right now i’m mostly through formatting the text, and gathering source material for the page decoration. As far as my Feed the Shoggoth! game goes, i have someone assisting with some art production duties, cleaning up the artwork that i’ve done. I laid out a spreadsheet for all the cards, and figure that i’ve got about 17 pieces of art that need re-doing. So i’m glad that’s going on in the background whilst i devote time to this other stuff. The beeeeeeg news, however, is that the Gen Con ENnie awards were announced over the weekend, and Cthulhu by Gaslight won the Gold for Best Supplement! Hot damn! I can now officially say i’ve been part of an award-winning book. Big congrats to Kevin Ross and William Barton, the authors of the book, all the artists who came through big time, as well as Paul Carrick, who won a Silver for best Cover Art. Posted in Cthulhu by Gaslight, Medieval Tales, Miskatonic River Press | Comments Off on Various stuff. 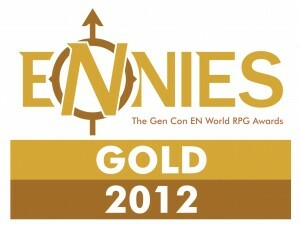 Plus, Gaslight wins a Gold ENnie! …literally. I just got a contract from MRP, so now i can officially announce that i’ll be working on Tales of the Sleepless City, a collection of Call of Cthulhu adventures centered in and around New Yawk. I’m sure the fact that Tom Lynch is from NY has absolutely nothing to do with this. 😉 In addition, there’s a couple of other projects attached to that contract, but, um, i can’t talk about them yet. Meanwhile, the art situation seems to be slowly untangling itself. It looks like i’ll have found some people to help out soon, so i need to get some raw card scans done and sent to them, and see what they can do with the designs. If absolutely nothing else, i’ve gone and proven to myself that i *can*, if i need to, clean up the card designs well enough. And i’ve already got the template going (fonts, border, etc.) so that they’ll all be legible. Looking through them, though, i know that at least some card art needs to be redone entirely. Not to get down on myself, but some of it just looks like crap, and i know i can do better. Work on the Medieval Tales book has been going in fits and starts. I need to finish designing the chapter head sections, which is proving more difficult than i first thought.